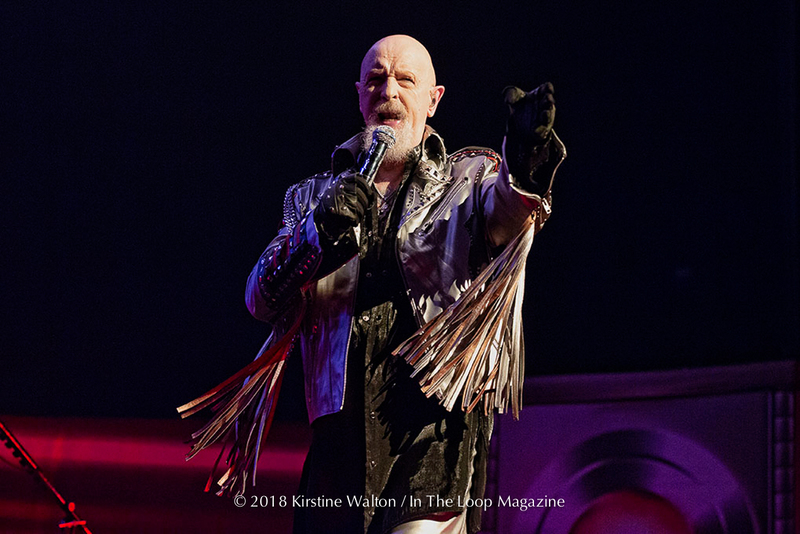 The second leg of Judas Priest’s Firepower tour steamrolled through Chicago on Wednesday, and unsurprisingly, the metal gods delivered in grand fashion. The post-Glenn Tipton era of Judas Priest is starting to find its stride in the twin attack of Jason Faulkner and Andy Sneap, and Rob Halford is now officially a man who exists outside of time; his vocal prowess remains strong (though a bit more carefully measured), and he stalks the stage like a man half his age, rousing the crowd to a fever pitch during “Turbo Lover” and “Hellbent for Leather,” performed from his signature motorcycle in layers of leather regalia. Faulkner is a rock star if ever there was one; the man was clearly born to be playing heavy metal to huge crowds. Constantly working the crowd and engaging with fans while blazing through Defenders of the Faith crusher “Freewheel Burning” and the grinding trade-offs with Sneap during “Sinner,” he’s everything you want to see in a metal guitarist. New tune “Rising From Ruins” found a mid-tempo groove not unlike early classic “Beyond the Realms of Death,” and while it was already one of the strongest cuts on Firepower, it really rose (see what I did there?) to the occasion on a live stage; this is one that should stay in the set for a while. Priest’s sound remains unique in hard rock; they’ve always towed a line between a classic rock groove as well as a thrasher, speed metal approach to certain records or eras. To that end, touring with Deep Purple (if for no other reason than the two being so closely related in terms of longevity) makes sense, though Priest’s abbreviated set in light of that was disappointing, given some gems that have appeared throughout the tour (“No Surrender,” “Saints in Hell,” and “The Ripper” were MIA). Priest’s fanbase and live show are bulletproof; they could have carried the entire night.